I am fascinated by the attention-versus-distraction theory upon which Davidson builds the initial standpoint of her work. The idea that whatever exists and whatever does not exist in our current consciousness is a result of lifelong interactions between attentions that are marginalized by distractions and distractions that succeed in becoming attentions attracts my attention, or in other words distracts me from another attention! I would accept that my mind and my world are continuously constructed and deconstructed by two apparently opposite forces playing the leading roles of the same game. Whatever is considered to be my valuable intention today has once played the role of a deceiving distraction from an everyday life. To choose a human science as my major could be a kind of distraction when I look at it from the dominant intention of the surrounding world. However, when one spends some years inside a deliberately chosen distraction and dominates it and calls it specialization, the second level of the game shows up, when anything beyond that specialization would be estimated, or underestimated, as a distraction. This is not really a rule; this is what an educated mind accepts as a rule to get rid of the constant invasion of uncontrollable distractions that remind it of all human limitations in mastering a vast territory. Life is short, choose your path and forget about other journeys. The path is your attention, the attention is your intention, and all other journeys are distractions. Following the current academic tendencies in the humanities, I would equalize attention with specialization, and distraction with whatever beyond that specialization. “Without focus the world is chaos” (Davidson 2) but how are we going to preserve our small order, or focus, and be satisfied with that in a world that is decentralizing everything by interconnecting infinite centers to each other. Now that in the digital world many apparent boundaries between attentions and distraction are passable by a simple click on an unrelated link and “everything links to everything and all of it is available all the time” (6) how could we draw a line around a territory and call it our field of specialization without being concerned or curious any more about anything that exists beyond that hypothetical line? “Attention is about difference” (49) but if it is not challenged by new distractions I would call it a sign of indifference rather than a prolonged difference. I would like to go beyond the secure boundaries of conventionally defined fields that justify exclusions before inclusions. I believe in interdisciplinary approaches and interactive projects in different levels of education as the dynamic patterns of keeping balance between attentions and distractions in a world that does not draw any absolute boundaries between various subjects any more. Through interdisciplinary approaches hypothetical boundaries are pushed away and what used to be called a distraction would function as an essential component of the central attention; and that would be in harmony with the basic structure of the digital world. To keep going through the tension of attentions and distractions, is to dance among the illusionary boundaries of lights and shadows. I have always tried to move forward through that tension, if distractions do not entrap my attention anymore, that means I have lost my ability of intellectual survival , and the game is over. Cathy Davidson’s main interest in Now You See It seems to be the plasticity and adaptability of the brain in general, with a particular focus on the ways in which this natural behavior and selective attention should be reflected in the ways we learn and teach. Yet, because of my own personal experience, I was particularly intrigued by another thread that kept on coming up in her work: bilingualism. I grew up in a bilingual English/German household, and have spoken both languages fluently since before I can remember. Since my mother (a native German speaker) worked evenings until I was well past my toddlerhood, I spent most of my waking hours with her for my first few years. At that point, I probably spoke German more naturally and fluently than I did English, despite being otherwise surrounded by English-speakers in the small central NY town my parents and I lived in. This of course quickly changed once I entered pre-school and grade school; it was then that I discovered that bilingualism—a thing that was so mundanely normal for me—was not the norm for everyone, but a source of fascination for my peers (“How do you say x in German? Do you know any bad words?”). To use Davidson’s phrasing, I suddenly saw “others treating our ways of doing things strange” (35) and realized the necessity of acknowledging and commenting on this part of myself–as well as suppressing it in the completion of my schoolwork. My bilingualism and my cultural heritage at once became my fallback “fun fact” about myself when meeting new people (or on the first day of school/summer camp), but also sometimes resulted in people using this linguistic category as “shorthand” (34), assuming I automatically possessed other “German” traits. The double-edged sword of cultural ownership/imposed labeling is a keen one. 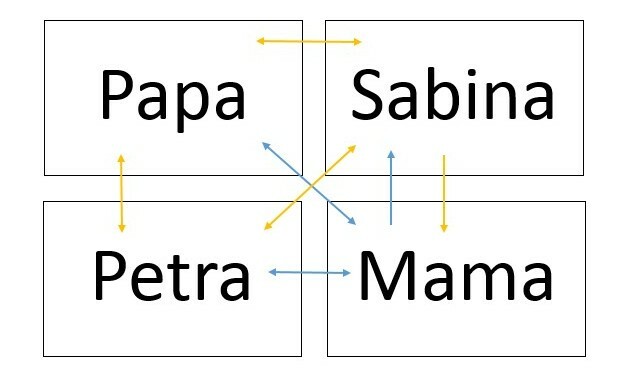 The blue arrows indicate communication in German; the yellow in English. Even though all of us can speak both, each person’s choice of language depends on who they are talking to. In reading Davidson and remembering my own experiences, I was reminded of a bit from Eddie Izzard’s 1998 filmed performance, Dress to Kill (original clip uploaded to YouTube by melinda923). In the clip in question, he mimics a quintessentially stodgy Brit complaining about the increasing imperative to speak more than one language: “Two languages in one head? No one can live at that speed!,” Izzard’s Stodgy Brit exclaims, dismayed. Eddie Izzard on Bilingualism (I’ve had a bit of trouble getting this to play on TubeChop–it should be 1:51-2:12 of the original video linked above). Of course, his tongue-in-cheek comment makes the point that many people do indeed “live at that speed” (in and outside of Europe), but that English-speakers are notoriously stubborn about doing so. Language and translation are topics that come up often in Izzard’s stand-up routines, and which obviously interest him on a broader, more serious level as well; he has even performed on tour in both French and German. Is Izzard (though not a pedagogue himself) not right in encouraging the forging of new connections based on the acquisition and/or cultivation of a new/alternate code of communication? Izzard’s point therefore seems well taken in relation to the ways in which bilingualism (and second language acquisition) is treated in the average American school environment—that is to say, too often with heavy-handed inefficiency and oversight, as Davidson also suggests (94). One might even extend this to the foreign language examinations required of English graduate students: in the age of readily available access to tools ranging from scholarly translations to Google Translate, how necessary is it really to have superficial reading competency (much less full fluency) in another language—or two? Many admit that the exam is somewhat outdated, and what it tests is no longer fully relevant to all in the field, but are there not ways in which it could be better made to? In a way, these discussions of bilingualism—the rewards and challenges—seem also to align themselves with those of digital literacies: both are often perceived as skills worth cultivating, but ones we are still trying to gauge and deploy with often incongruent measures. Perhaps my ultimate question is this: can we really ever be bilingual English/digital? Can we ever truly “live at that speed”? Since you’d been directed to count all the passes, though, you would then convene with the Basketball Counters (who, all this time, have been doing to their calculations what you’ve been doing to the gorilla) in an attempt to arrive at an accurate picture of what’s going on here. That’s the collaboration that Davidson gestures ambitiously towards in her introduction (5), it’s the framework for the book’s objectives–to examine how we might adapt our schools and workplaces to account for this human tendency to pay attention to some things and not others, and to seek new information on what they’re missing when they need to problem-solve. But let’s suppose (in a little mental experiment) that the Invisible Gorilla experiment that no one directed the audience to count the passes—there is no clear problem to solve. Without this directive, people would watch the video with a more open filter, with the counting-inclined counting all sorts of passes in different categories, the sports-inclined watching the form of the passes, perhaps, the literature-inclined attempting to close read the scene for symbolic meaning, and a fair number of people just watching. A larger number of people, without their attention externally directed elsewhere, might see the gorilla–without telling everyone to count (as Joe deliberately neglected to do on Friday), most people see the gorilla. It’s a gorilla. In a group large enough, without this counting directive, people might generally see the gorilla and understand the passes and the coding of the colored shirts, and talk about what it means. But this central consensus on the (now obvious) gorilla presence would still generate a series of outlier groups: people who don’t think the gorilla is important, who counted all the passes between black shirts, or white shirts, or all the passes from one color shirt to different color shirts, and so on. They form their own small groups, reinforcing each other’s beliefs. 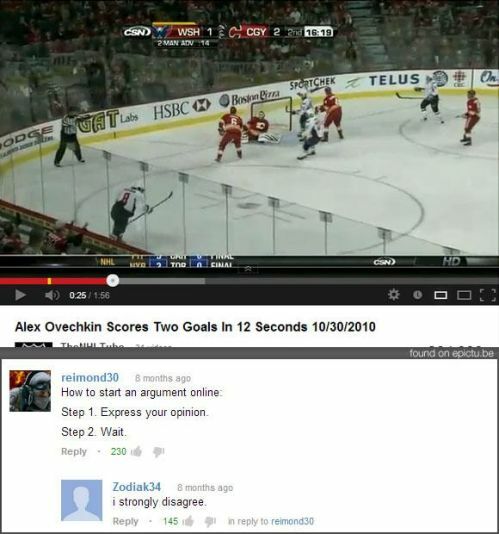 This is basically the internet in a nutshell. There is a mass of data, to be processed by people, with no filtering directives or directive towards problem-solving. Like Baby Andy (47), it’s just spitting data at us, and we’re selecting parts, giving them value, reinforcing the reproduction of that data, and grouping up with other people to form cultures where “Dada” is a word and “Mada” is not, where the gorilla doesn’t matter but the black-shirt passes do. Collaboration under these circumstances may or may not be as prevalent as under the “count the passes” directive, but this collaboration is fragmentary and self-reinforcing non-collaboratory (or intra-group collaboratory) activity is just as common. Team Gorilla and Team Mathematics don’t always talk. They have no reason to. This self-selecting group-identity without an impetus to collaboration creates what I call a Curated Reality (sometimes called a bubble world, or a pundit sphere, or when properly financed, a cable news network). Davidson seems particularly unconcerned about this (the book is deliberately “optimistic” [back cover] after all), but it does make me nervous. I’m usually one of those “the internet is THE BEST THING THAT EVER HAPPENED” people, but there’s no ignoring the fact that people (all of us) select data that we are already pre-inclined to find interesting, accessible or agreeable, and filter out as “crap” all that stuff which is uninteresting or contrarian, and are generally blind to these filtering activities. What this has to do with my experiences as a student and as an instructor grows out of the fact that, like Duke, my undergrad institution distributed iPods to its incoming freshmen (in the 2006-2007 school year). The problem was, without the financial resources of Duke or the Apple branding help garnered from Duke’s large public profile, the iPods were only distributed by specific programs in specific colleges. Unlike Duke’s student population, which as Davidson indicates was directed towards education their whole lives (64), the population at my not-quite-Ivy institution was less inclined to go along with the overtly experimental program, effectively fragmenting the student population (and the school) into iPod Education Advocates (developing apps and doing work), Happy iPod Hijackers (who laughed at this heavy-handed idea that if you just dump new tech into an old classroom things will get more efficient, and just used it to listen to music), and The Humanities Students (who did not receive the technology at all, despite appealing to the administration). The collaboration that Davidson commendably notes at Duke (65) collapsed before it even formed, except for isolated, intrepid pockets of iPod Education Enthusiasts and iPod owners. Like miniature Dukes. In the following years, whole colleges in the university abandoned the program. The programs that abandoned the iPod did so because collaboration and innovation was stifled–ironically, stifled because these programs had implemented free iPods in an unequal fashion and hoped that crowdsourcing without directives would somehow magically collaborate them straight into the information age. iPod education became a Curated Reality–those who had it said it worked, those who had given up on it said it was worthwhile but not exemplary, and those who never had it scoffed at the idea that technology had anything new to offer, and none of these groups was really interested in talking because there was no directive, no problem to solve. Collaboration became in-group only, and attention blindness became the mode of the day. While Davidson says Duke’s program never came with a directive (62-63), it did implicitly have one. Duke distributed the technology to a student population already inclined to work outside class time on improving the university, with specifically branded partnerships with Apple, under an educational initiative undertaken by the whole university with the direction of Davidson herself (64). In essence, she did the Invisible Gorilla experiment on a room full of professional counters at a conference on counting basketball passes–a directive is implicit in the context, creating an object of, and impetus for, collaboration. In the video, the user (a student or professor, perhaps, in a digital composition course) juxtaposes the “classrooms of today” (which are filled with laptops, mostly Apples) with the “classrooms of the past” (with patriarchal paintings and warped desks) (see 00:16 to 00:19), using Dictionary.com and proprietary clip-art to make a point about technology and classrooms in a painfully artificial use of technology that students would giggle a bit at. The video transitions from talking about technology in education generally to focusing implicitly on composition, challenging the notion that technology can only be used for “word processing” (01:48 to 01:50) while it fails to cite any uses that are not composition-oriented. The end result is commendable, but fails to reach outward beyond its implicit focus on composition technologies, proposing to enable a collaboration it implicitly fails to imagine. The video’s author challenges us to use technology in new ways, which in the video seems to mean making essays with more expensive software than a word processor. This video gets caught up (as Davidson does, a bit) in the rhetoric of technology as panacea for education–a Curated Reality based on enthusiasm for technology and education whose laudable enthusiasm frequently erases the dangers of technology inequality and of shoehorning technology into a classroom without regard for its actual pedagogical usefulness or the ways in which technology has already impacted the classroom. Technology, despite everything said, insistently remains a replacement for or enhancement of older technology, and paying attention to it at all is grounds for self-congratulation (see all of Davidson, Chapter 3). Likewise, it remains bound up in an implicit economic language where the cost of these technologies, and their accessibility, is ignored. iPods are used to record and distribute spoken lectures to other iPod users (Davidson 66), and Duke (and Davidson) congratulate themselves on crowdsourcing new ways to use technology to make education accessible to everyone (with the several hundred dollars necessary to purchase an iPod in 2006). Selective attention to one aspect of educational technology by a specialized group of educators with a specialized group of students (Davidson’s Duke and it’s implicitly elite student body) with the directive (implicit or otherwise–it was certainly obvious to Duke students) of modernizing educational practices creates a small group which can collaborate but collapses the possibility of collaboration outside that context–no one cites the problem of unequal implementation, or of the social forces built into educational systems which disqualify certain approaches (and which contaminated Davidson’s experimental control of not telling students what to do). Davidson, pointedly, recognizes this skewed basis but continues to universalize her experience at Duke anyway (64). She claims there are no directives or conditions–but directives were built in everywhere. Likewise, at my undergraduate institution, the unequal implementation of the initiative put further directives in the mix, rapidly enabling very specific kinds of collaboration and utterly destroying any other kind. My much-belabored point is this: Much like the video’s limited embrace of technology, Davidson’s ideas of where this technology goes in Chapter 3 perpetuates some of the problems she wants to fight: it disables the awareness of attention blindness and collaboration that she champions. As many education technology enthusiasts (like me, and Davidson, and others) have done, we have challenged the conditions of an old, conservatively anti-technology Curated Reality on education and, in the process, perpetuated our own Curated Reality, blind to our structural preconceptions. We have enabled some forms of collaboration by disabling others, blind to our own implicit directives while claiming to be “open.” Our utopia is smaller than we imagined, because membership and collaborative knowledge is governed by criteria we pretend aren’t there. Somebody Should Totally Just Stab the Research Paper! Because of my own lack of digital proficiency, I don’t have my students complete any kind of digital writing projects. The closest thing to a “digital essay” that I assign them is the material culture multimedia project that serves as their last assignment of the semester. Now, I don’t mandate that they use digital media to transform their written narratives, but I’ve found that the students who opt to create original videos are almost always the most impressive. Their “capstone” research papers, however, rarely are. Which brings me to the moment in Cathy Davidson’s text where she discusses the term paper as a persistently problematic genre, especially when comparing it to digital writing: She claims that her students’ “writing online, at least in their blogs, was incomparably better than in the traditional term papers they wrote for the class. In fact, given all the tripe one hears from pundits about how the Internet dumbs our kids down, I was shocked that elegant bloggers often turned out to be the clunkiest and most pretentious of research paper writers. Term papers rolled in that were shot through with jargon, stilted diction, poor word choice, rambling thoughts, and even pretentious grammatical errors” (101). 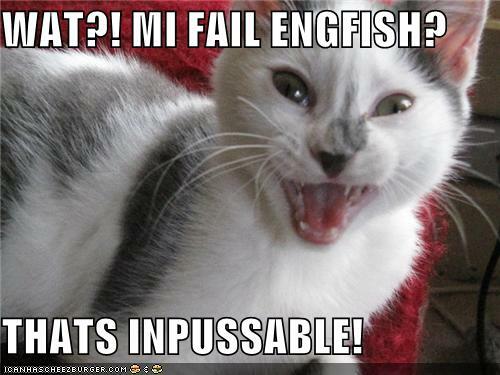 Not even a LolCat can make Engfish charming. Following her realization that her “best friend” and Queen of the Plastics Regina George has been disobeying “the rules of feminism” by bossing her and the delightfully absent-minded Karen around, Gretchen channels her anger into this hysterical diatribe against Caesar, in which she assumes the perspective of a fed-up Brutus. Although statements like “Brutus is just as cute as Caesar” are clearly inflected with the jargon of a teenage girl, there is something undeniably charming about Gretchen’s passion and her juxtaposition of high school drama with historical tyranny (oh, the irony!). And at times, I wish that my own students’ papers had even a shred of this kind of verbal passion, even if it completely undermines the kind of “academic discourse” that we are supposed to be teaching them in E110. At least then I would be able to discern their level of commitment to the jargon that infiltrates their written work. So Davidson’s text has got me thinking: what would a research paper look like if it was done entirely through a digital medium like the blog, from topic proposal to the final Works Cited page, chronicling every stage of the research process in between? Would we be able to transfer “traditional” concepts of the research paper to the Internet without making any changes? If not, what would those changes involve? And of course, the idea of proper assessment rears its ugly head as well. But who is to say that we can’t marry traditional concepts and rubrics with the affordances of the web? I fear I’ve presented more questions than answers in my post. Alas. On the first day of the semester, I have my students play “Two Truths and a Lie” as a get-to-know-you/ice-breaker activity. Last semester, my three “facts” were that I was thirty years old, that I had a daughter, and that I didn’t read any books over the summer. Pretty much every student suspected that the third one was a lie. Sure I look young, but how could an ENGLISH teacher not read any books? Blasphemy! All of the students that guessed the third one were, however, wrong. The correct lie was “I have a daughter” (but don’t tell my spoiled dog who thinks she’s human). Perhaps though my truth was a bit misleading. Yes, I didn’t read any books, but I didn’t listen to quite a few (the whole 5,000ish pages of the A Song of Ice and Fire series, actually). I listened to all of these books on my iPhone, much in the way that Cathy Davidson describes Duke students circa 2003 listening to various lectures and recordings on their iPods. When describing the benefits of being able to listen to course material at their own leisure, Davidson explains how all classes “could be taped and listened to anywhere. [Students] didn’t have to go to the library or the language lab to study. [Students] could listen to assignments on the bus, at the gym, while out on a run—and everyone did” (66). Here Davidson points to a very real benefit of being able to listen to course material on the go: the convenience. Not only do you not have to go to the library to study, you don’t have to sit down. As Davidson notes, you can go to the gym or commute, but you can also do a variety of other necessary tasks, such as grocery shopping or cleaning. Basically, you no longer have wasted time. You can make it so that you are always working. While this is an important benefit of being able to listen to texts, it is, however, not the only benefit. Audiobooks have advantageous aspects, even if you listen to them curled up in an armchair with a cup of tea. For instance, I am a really slow reader. Like, painfully slow. But with audiobooks, my reading speed is predetermined (and much faster than it would be otherwise). My mind doesn’t wander the way that it does with traditional texts, partly because it’s like listening to someone tell you a story. I feel somewhat obligated to make sure that I’m paying close attention, lest I hurt the narrator’s feelings. Additionally, audiobooks can add material to the text that cannot exist in a traditional print format. Watch this quick clip to see what I mean. For those of you unfamiliar with the story you just heard excerpted, it’s considered to be the first gothic novel. And even if you were unfamiliar with what that genre entails, you’d probably be able to venture a pretty good guess from that 20 second clip. The narrator’s stony voice, the hushed whisper at the end, and—perhaps most importantly for my point—the clap of thunder and rain at the end of the chapter all provide the atmosphere that is quintessential to the gothic novel. While the text of the novel does not need these added elements in order to be gothic, I nonetheless think they add something valuable to it. Yet despite all of these benefits, audiobooks are still not considered “serious” by the academy. Davidson asserts that after the introduction of iPods, “sound suddenly had a new educational role in our text- and visuals-dominated classroom” (66). While this may have been the case at Duke in 2003, I do not think it remains so for universities as a whole. Listening to audiobooks instead of regular books is certainly not encouraged, and I’m hesitant to even admit that I do. When I was talking about this issue the other day with someone —who is also a self-admitted audiobook fanatic—he asked me: “How do you talk in class about a book you listen to? You can’t close read it, right?” And no, you can’t close read, but you can close listen, and I, for one, think that that is just as good.